The species is distributed in Asia Minor, Transcaucasia, Turkey, and Northern Iran. In Armenia the subspecies K. a. madina (Zhdanko, 2000) occurs, which is found only in two areas in the country: a spot in the Vayots Dzor region and southern slope of Meghri mountain ridge. The species inhabits tragacanth mountain steppes at the elevation range from 1500 to 2200 m a.s.l. In Armenia the species uses Astracantha macrantha as a host plant; however its distribution pattern is patchy, despite the fact that the host-plant is quite widespread in the country. Probably, there are other habitat requirements, which are not yet known. Alcedo Blue has one generation per year having butterflies on wing in mid July to early August. The species is rare within typical habitat. During 2003-2013 the species demonstrates stable population trend (p>0.05) although some fluctuations exist. Most probably it happens due to the fact that host-plant of Alcedo Blue is a thorny bush, which is not eatable by livestock, therefore grazing is not removing the plant from the habitat. The species is not included in the Global, European, and Armenian Red Lists, as well as in CITES and Bern Conventions. Taking into consideration its patchy distribution and low abundance, the evaluation of Alcedo Blue suggests conservation status Near Threatened. 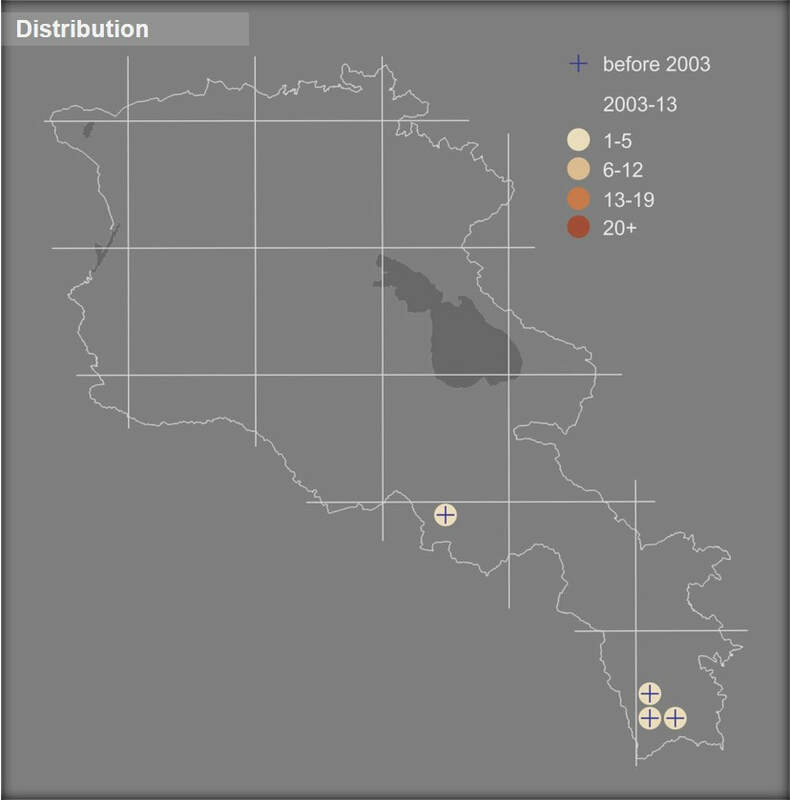 At current the species' distribution is partly covered by Zangezur Biosphere Reserve and Gnishik Protected Landscape, and appropriate Emerald Sites. 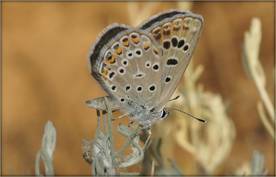 Also the species is presented in Gudemnis and Gnisheek Prime Butterfly Areas. Among proposed conservation measures it is suggested to continue the species' monitoring aimed at further tracking its population dynamics, and further study of its habitat requirements, which can help in clarification of hidden threats.